Download the Mickey Mouse Birthday Card to print and send by whatsapp. CI think the best-known Disney character needs no introduction, it's a classic that the years go by, new generations are born and all the children still love it. 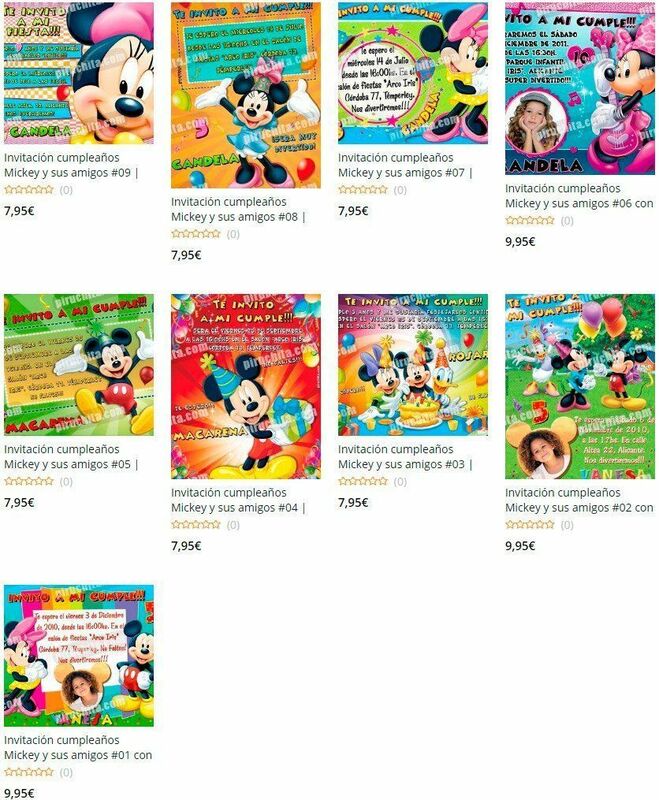 That's why Piruchita could not miss the Birthday invitations Mickey Mouse and his friends for free. Although Mickey Mouse is the best known, over the years were appearing new friends who joined him forming a fun family. Since then they have not stopped appearing new versions of the cartoons to this day. Mickey's main friends are Minnie Mouse, Goofy, Pluto, Donald and Daisy. Surely you know them all. But do you know how old Mickey Mouse is? Although he has been with us all his life, we are not aware of his age because we always see him as jovial and "lively", and that is because the years do not go by. Well there it goes: 18 November 1928 was born! Why did not you think it was so old? Yes, a few days ago he served 88 years. And you knew that at the beginning it was not called Mickey but Mortimer? What an ugly name Walt gave him when he first drew it on a train trip, in fact it seems somewhat dismal. Fortunately, his wise woman suggested changing his name. A unque the truth is that what I just told is more of a legend and there are several versions of the origin of Mickey, and according to the wikipedia, the most successful is that it started with a request from Disney to the cartoonist Ub Iwerks (yes, it was not really drawn by Walt, although it was he who put the voice and character), to compensate for the loss of a license to Universal of a similar character, a nice rabbit named Oswald ... do not you find some similar ones? 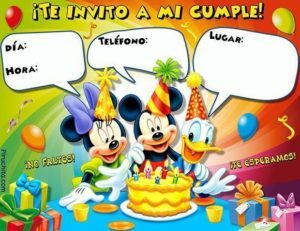 Did you know that we also offer you Premium versions of these birthday invitations from Mickey Mouse and his friends? You can ask us to personalize the invitations with the birthday information so that they are perfect! I know you're here to download the invitation, so now that I've told you some curiosities of the most famous mouse, I do not entertain you anymore and here you have them.